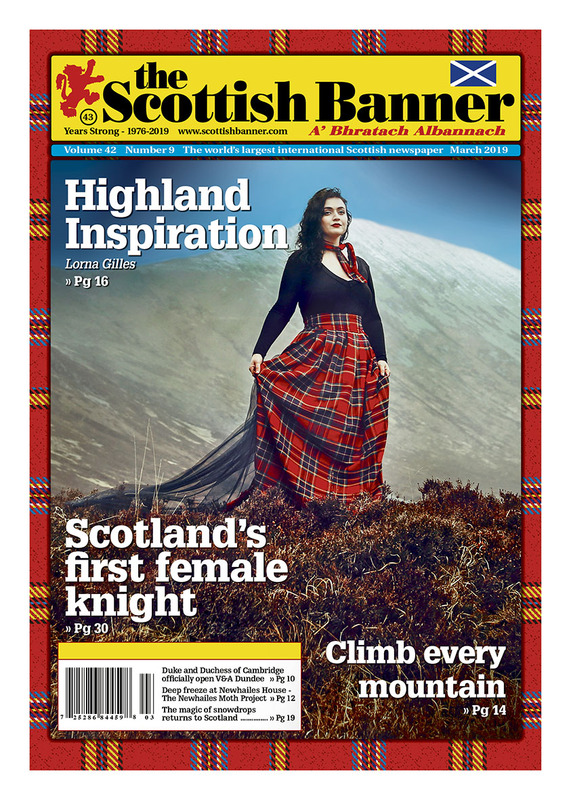 Gracing our front cover: Highland Inspiration-Claire Marie wearing Lorna Gillies designs. Photo: Darja Bilyk. This month many of our Celtic cousins will celebrate their varied identities with Wales celebrating St David’s Day and the Welsh culture on March 1st, Saint Piran’s Day is celebrated on 5th March as the national day of Cornwall and the widely known Irish Saint Patrick will be celebrated across the world on March 17th. What do these celebrations have to do with Scots, who have their own day in November with St Andrew’s Day? Perhaps more than we realise, as Celts the link is deep and strong amongst us. Both Scotland and Wales have two amazing, and mythical, national animals. The Welsh dragon is known the world over and proudly is shown on their flag, while Scots have the lesser known but just as unique unicorn which appears on Scotland’s Royal Coat of Arms. Scots hero Sir William Wallace may also have Welsh back ground as Wallace is said to translate to Welshman. Who doesn’t love a wee dance? A twmpath is Wales’ own form of a ceilidh – the traditional Gaelic social gathering involving folk music and dance originating in Scotland and Ireland. The twmpath includes the familiar trad music instruments such as the accordion and fiddle. Like Scotland Wales has its own language which they are working hard to preserve, and Welsh may have originated by early Welsh settlers to Scotland, who went on to develop Old Welsh. Also preserving their own language heritage are the Cornish. The language is spoken by hundreds of people in Cornwall who are working to revive and promote the Cornish language, identity and culture. Though at opposite ends of the country, Scotland and Cornwall are ‘linked’ by a rite of passage journey for many. The well-trodden 874 miles/1,407km journey from Land’s End to John o’Groats, the most south-westerly point of Cornwall to the north-eastern tip of mainland Scotland, has inspired many to travel the length of Britain by car, bike and even on foot. Recently Cornwall was also given minority status – the same protections as the Welsh, Scottish and Irish – under European rules. At the closest point Scotland and the North Antrim Coast are just 12miles/19 km apart, and the migration of people between the two countries has been going on for centuries. Today a visitor to both Scotland and Ireland will pick up numerous Celtic similarities between these two great nations. One would be the use of the Gaelic language in street signs, spoken word and music. Whilst the Irish Gaelic and Scots Gaelic languages are distinct, they remain part of the same dialect and individual words and phrases remain close enough for each to understand the other. Both are great lands to try a dram as each blend their own ‘juice of the barley’, whether it is spelt whiskey or whisky. The aptly names ‘water of life’ flows as uisce beatha (Irish Gaelic) or uisge beatha (Scots Gaelic) and both nations produce world class products and are important to the local economy both as exports and for inbound tourism. Regardless of which you prefer both the Scots and Irish will raise a glass with the traditional sláinte, or cheers. Both nations as well have seen their nationals spread across the world. The Irish and Scottish Diaspora today celebrate their land of ancestry with millions of people claiming ancestry to one, and often both. Scotland never seems to go out of fashion and that can also be said for the great fashion the nation produces. Tartan and tweed are so linked to Scotland and represent quality, history and fashion. This month Highland designer Lorna Gillies speaks to us about how she is using ancient cloth in a progressive way. The ancient practice of medieval combat takes place at many Scottish and Celtic festivals around the world today. Scotland now has its very first female knight who has spent a great deal of time and effort learning the sport carrying literally the weight of armour and the nation on her shoulders. Munro bagging is a past time that is uniquely Scottish. A Munro bagger is somebody who makes it their mission to conquer all of Scotland’s mountains which have an elevation of greater than 3000 feet (914 metres). There are 282 mountain ranges that classify as a Munro, so those who take up this challenge certainly deserve recognition. This month marks the 100th anniversary of the death of Sir Hugh Munro who started the craze and his name literally lives today in Scotland’s majestic mountains. It is great Scots have a strong bond with many nations around the world, especially where Scots settled. However, amongst the Celtic nations, Scotland certainly has a special bond with links between it and many neighbouring nations. There are of course seven Celtic nations and this bond runs across all of them. Though we are clearly Scots in our heritage, I know my own family can trace back to the ‘Cathedral Town’ of Letterkenny in County Donegal, Ireland. Millions of Scots will also have connections and bloodlines with various Celtic nations, interwoven in their family history. Celts share many cultural, historical and social identities, and whilst different to Scotland, those nations are without a doubt very much our Celtic cousins.